Doctors currently recommend eating fish about 2-3 per week to get the health benefits without risking mercury poisoning. And we suppose it’s wise to avoid that. But aside from that one little risk, fish is really good for you. Eating some every day can give you a major head start on your RDA for lots of vital nutrients plus protein and healthy fats. On the other hand, mercury poisoning causes debilitating neurodegenerative disorders. Can it ever be okay to eat fish every day? Read on to find out. The biggest concern with eating a lot of fish is mercury poisoning. Mercury is a naturally occurring substance and is not problematic in small amounts. However, too much can lead to troubling symptoms that affect children (born and unborn) most significantly. Acute mercury poisoning can lead to permanent neurological deficits, including developmental delays in children. There is no cure, but further progression can usually be halted by removing the source of the mercury. Really bad levels of exposure might require chelation therapy to remove the mercury from your system. Unfortunately, neurological disorders in children from mercury are typically permanent. Adults are likely to find their symptoms temporary. In general, larger, predatory fish have higher levels of mercury because they feed many on smaller fish who each have a lower level. They also live longer, during which time the mercury continues to accumulate. This is the same way that humans can end up with too much mercury if they eat a lot of fish. But, stresses Eric Rimm, professor of epidemiology and nutrition at the Harvard School of Public Health, “For most individuals it’s fine to eat fish every day.” With the exception of pregnant women and children, you can safely eat fish every day without worry of mercury poisoning as long as you limit the amount of high mercury fish to two servings per week. Eating fish affords many positive health benefits, including improved metabolism, sleep quality, skin quality, and concentration as well as lower inflammation. But that’s not all. Read on for six great reasons to eat more fish. When it comes to red meat, it is always best to choose the leanest cuts possible. But with fish, it is actually the fattiest kinds that are most healthful. That’s because the fat in fish is in the form of Omega 3 fatty acids , or “good” fats. Omega-3s contribute to the optimal function of the brain for starters, but also play a critical role in cardiovascular health. Regular consumption of omega-3 fatty acids can help lower the risk of heart disease or stroke, and slows the growth of plaque in the arteries. It also lowers triglycerides (i.e., “bad” fat) and reduces blood pressure. Swapping fish for other forms of protein like red meat, chicken, pork, and lamb can be a smart choice for heart health. 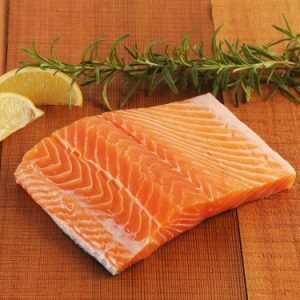 The omega-3s largely deserve the thanks, but recent studies indicate that it may be the combination of omega-3 fatty acids and other nutrients in fish that cause the lower incidence of heart attack or death from heart disease among people who eat a lot of fish. Get plenty of vitamins such as D and B2 (riboflavin) plus calcium, phosphorus, iron, zinc, iodine, magnesium, and potassium in every serving. Fish is a natural source of Vitamin D , which is otherwise only synthesized from sun exposure. But many people are nevertheless deficient in D because we spend so much time inside. Because vitamin D plays a crucial role in allowing the body to absorb a lot of other nutrients, without it we may experience deficiencies despite adequate intake. Think of your daily serving of fish as a booster for everything else you eat throughout the day. 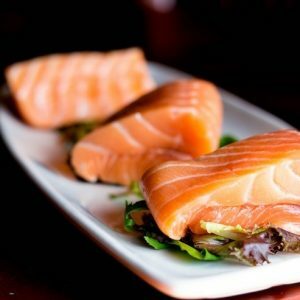 Scientists are still trying to determine why, but it’s clear that people who eat the most fish have lower than average incidence of depression . It may be that an overall healthy diet is associated with better mood, but we also know that omega-3 fatty acids can affect the level of feel-good chemicals dopamine and serotonin in the brain. Finally, as fish is naturally able to reduce inflammation, eating a lot of it improves blood flow. That can also help improve brain function and smooth out mood swings. An autoimmune disorder is when the body’s immune system gets confused and attacks and destroys healthy body tissue. One of the most common examples is Type 1 diabetes, in which an immune system attacks insulin-producing cells in the pancreas. There have been multiple studies that indicate lower incidence of type 1 diabetes in people who consume omega-3s or fish oil regularly. Early information seems to point to lower risk for other autoimmune diseases like rheumatoid arthritis and multiple sclerosis as well.